One of my friend shared with me Mooli Ki Sabji one fine day in office. I really liked it. Ever before that I never even bothered to taste Mooli commonly known as radish. One fine day I thought that I should try some experiments with Mooli. Started with Mooli Ki Sabji and followed by Mooli Paratha. Mooli Paratha turned out to be my favorite paratha. Find out the recipe below. Mould wheat flour to make firm dough. While moulding 3 cups wheat flour put 1 and 1/2 cups water, 1/2 tsp salt and 2 tsp oil. Make sure that dough is not sticky. Heat a pan and put in 1 tablespoon oil, cumin seeds, ginger paste and turmeric powder and fry for 1 Min’s. Put in chopped green chili and fry. Then put in the grated radish and fry for 10 Min’s till its dry. Put in chopped coriander leaves. Make round balls from the dough. The size should be a little bigger then the table tennis ball. Roll the dough ball into a little bit of dry flour and roll it into small flat round shape. Then place a tablespoon of the stuffing on it and close from all sides. Then again apply some flour powder and roll it into bigger round shapes, just like a chapati. Then apply 1/2 tsp ghee on the frying pan and place the paratha on it. After 5 Min’s, apply 1/2 tsp ghee on the upper side and turn. Fry for 5 Min’s. 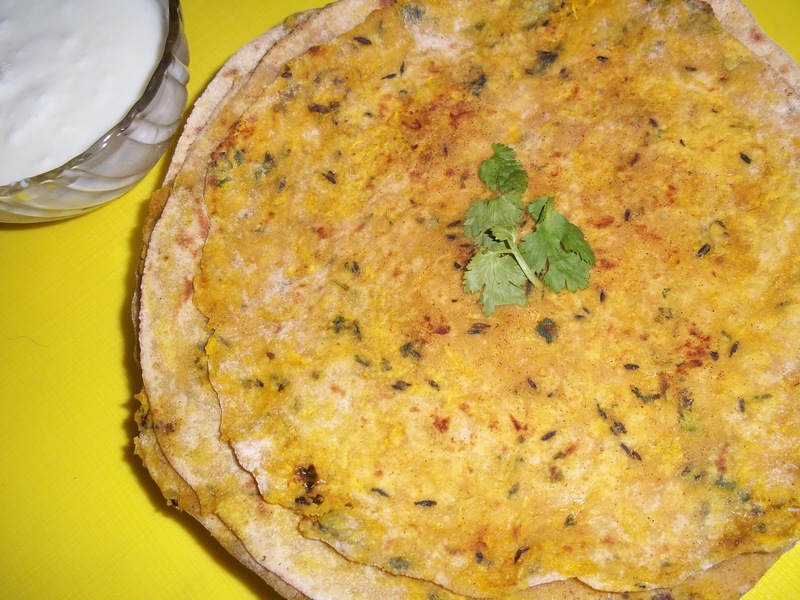 Note: You can check this gobi and methi paratha recipe too. one of my mom's specialities.. perfect for brunch!! Paratha looks awesome and healthy. Hi Raksha thank you for visiting my space and for following me…mooli paratha is my fav too…happy to follow you. I don't mind a hearty breakfast like this everyday! Today is the first day I am visiting your bloging website. Recipe's are good.If you add some pictures (step by step how you made it) in to it will be great.